It’s been a little over a year since Bit.Trip Beat was released for WiiWare and became an immediate must-have for gamers. The mechanics of the Bit.Trip series focus on rhythm and style to create an engaging experience for any gamer while paying homage to Pong and other 8-bit arcade classics. Bit.Trip Runner, the most recent addition to the series, takes control of CommanderVideo as he runs, kicks, slides, and more to survive the new territories discovered after the events of Bit.Trip Void. But can this mixture of gorgeous art and music along with an expected cruel difficulty and limited game time prove to be worth 800 Nintendo Wii points like its predecessors? Gaijin Games, the artistic minds behind the Bit.Trip series, have delivered nothing short of vibrant, colorful levels drawn from 8 and 16-bit classics. In particular, Bit.Trip Runner has been heavily influenced by the original Pitfall. Each level is 2D and more-or-less flat with a constant running speed for our hero, CommanderVideo, as he does whatever his skill-set allows to survive an abundance of varying hazards. 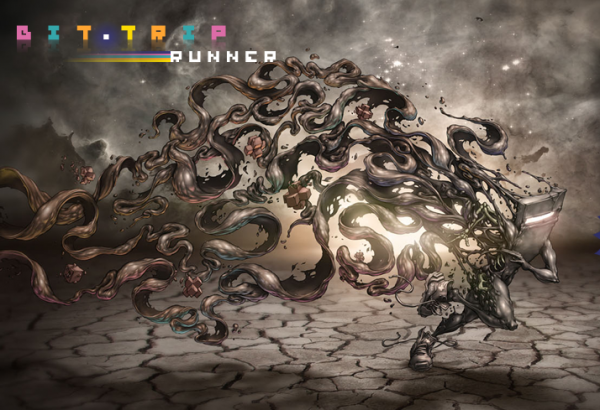 Runner focuses on the visuals by changing up the music and adding more sound effects as well as enhancing the trail of “color” CommanderVideo leaves behind him as you collect more items. The background in Runner has more going on this time around and is much more vibrant compared to the old titles, with a “Saturday cartoon” feeling to it. Some of the catchy songs seem destined to become cult hits, and since the music intensifies whenever more items are collected, there’s a strong incentive to collect, collect, and collect. In the predecessors, on the other hand, the sound and color would diminish for every mistake made. Aesthetic appeal is still a driving force behind the Bit.Trip series, and continues to prove how good gaming is nothing without a sense of style and beauty. Bit.Trip Runner changes things up in a surprising manner. All the past games in the series give you control over the direction your character can move as you try to collect/avoid the appropriate items to keep the music going and color alive. This time around, Gaijin gives you no control over how fast or in which direction CommanderVideo can travel. The player will unlock different skills as he or she works through the 50+ challenges, starting first with the ability to jump, and eventually progressing to sliding, kicking, and even more. At certain points, there are an overwhelming number of obstacles to avoid and having so many things going on in the background becomes fairly frustrating. If there’s one thing Gaijin does right for this quick-response survival game, it’s that CommanderVideo is immediately brought back to the start of a level when the player crashes or falls, instead of having to manage your way back through a game over screen. After expressing his appreciation for rock-and-roll, he continues running instantly. Initially, these gameplay elements come across as overly simplistic and not having any checkpoints can become beyond frustrating. Gaijin has worked around all of this to assure it won’t disrupt the flow of gameplay. Yes, it’s true that there are only a total of four to five actions one can perform, depending on how far you are in the game, but each is unique and there are many ways to use each skill within a given level. As the player progresses, he or she will become so engulfed in the level that avoiding all the baddies, pits, and various hazards becomes second nature. This still does not mean the game will be easy, especially since Bit.Trip Runner is by no means easier than the other three games. This extreme difficulty is a byproduct of having a game that takes inspiration from arcade classics, which are notoriously hard as any veteran gamer will attest. The game takes place in three worlds with twelve levels each and includes a final boss to each world. 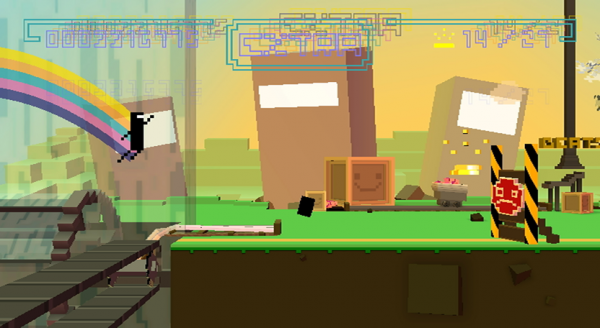 In every level there is a set amount of gold and “crosses” that the player needs to collect; if the gamer gathers all of these items by the end, a bonus retro-style level begins. 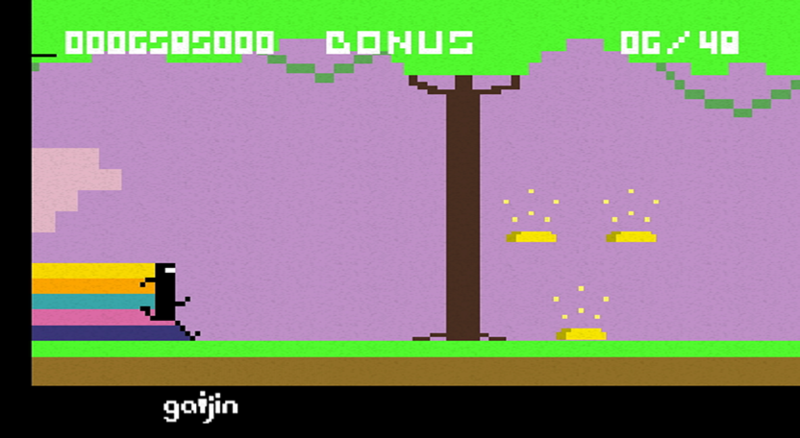 These retro levels are identical to Pitfall and offer extra points and an even harder difficulty to them. Even though some argue that it is impossible to collect each and every bit of gold, Gaijin Games has announced a prize for any individual that can prove 100% completion. This does leave to question why there is no form of online leaderboards, let alone any type multiplayer available. So besides compulsively setting out to collect everything, is there much more to this game after beating it? The answer is yes and no. For a while you will without a doubt be excited by every aspect of this game and have a blast challenging friends and/or roommates to beat your score or just have a good laugh watching them fail miserable. After some time has passed there will also be plenty of reasons to revisit some levels, as there is so much to see that there is no way you can notice it all the first time through (like a cameo by Super Meat Boy). However, common to all the Bit.Trip series, there isn’t much more to this game than what has already been mentioned. When it comes down to it, the question really is if this highly entertaining game with a short life span is worth eight dollars for you. 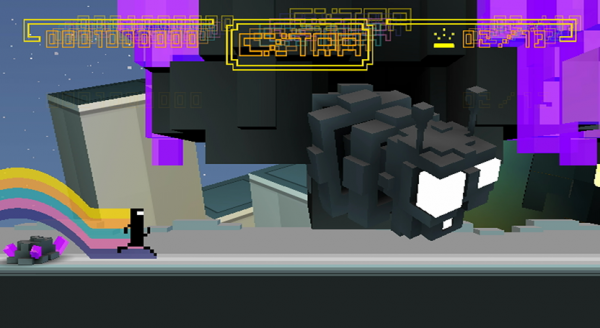 Overall, Bit.Trip Runner is an excellent game filled with 8-bit nostalgia and delivers as a member of a notoriously difficult and entertaining series. The music and art behind CommanderVideo’s adventure is uplifting and brings a constant feel-good experience to the potentially frustrated player. Although some levels can come off as impossibly hard, intelligent programming and smooth controls promise a rewarding victory for when you do finally get past that last pesky UFO. Bit.Trip Runner is an example of just how good a video game can feel when gorgeous visuals and rhythmic gameplay are when combined with fast-paced, humorous elements. It comes down to a matter of price for a potentially short-lived game, and a player deciding whether or not 800 points is too much for any Bit.Trip title. 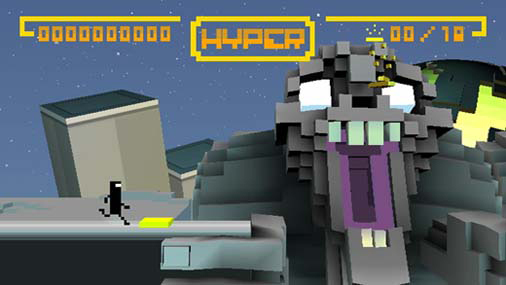 Regardless, Bit.Trip Runner is a fantastic WiiWare game that adds to an already popular and unique franchise. That is, if you can avoid throwing your Wiimote at the wall in frustration.